Greetings from New Delhi, India, where I am recovering from a migraine (probably caused by the ill-advised mixing of vodka and fake mango juice) and from a day-long trip to Agra. Long day of work awaits. Sigh. In the mean time, I’ve just been informed that one of my old short stories, “King Rice”, which was ostensibly about a cricket match in Guyana, but intended to be about subtle manifestations of the legacy of imperialism, was reproduced in an academic anthology called, “The Bowling Was Superfine” last year February. A review of the book is here, from an ESPN website. It’s sort of surprising when my works, in their entirety, pop up in other people’s books. I don’t recall signing any release forms, but that means nothing –I sign a lot of stuff I forget about, specifically when it pertains to the further exposure of my work. What I care most about is that my stuff gets out there, unaltered, and that may name remains attached to it. Mind you, I would have liked to have been informed when the book was released! Anyway, back to work. I leave you with this, a tree I saw at the Taj Mahal complex. 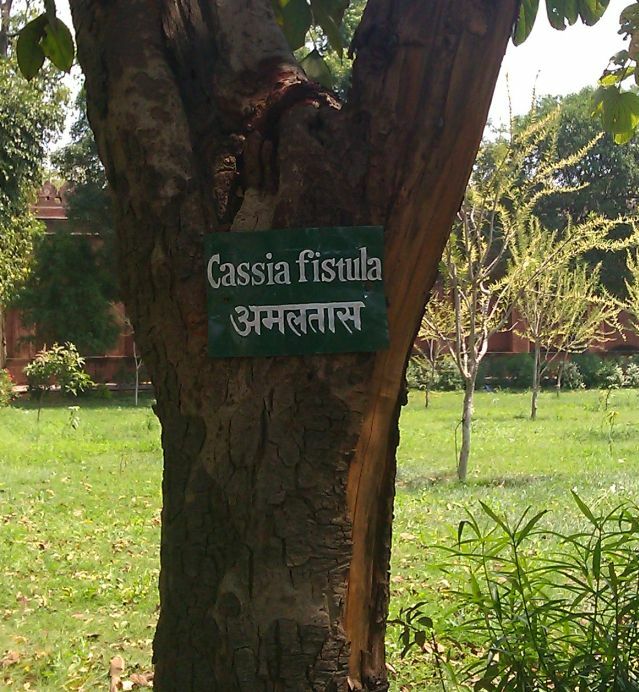 Exactly how does a tree get a name like “fistula”. I don’t want to know how it was used. Ewww.